The Cottage Pond blue hole, North Caicos. For most, this scenic deep sinkhole pond does not offer much. It’s a free and easy stop off of Sandy Point Road, so we recommend that those on a day trip to North Caicos take a few minutes to see it. The Cottage Pond blue hole on North Caicos. 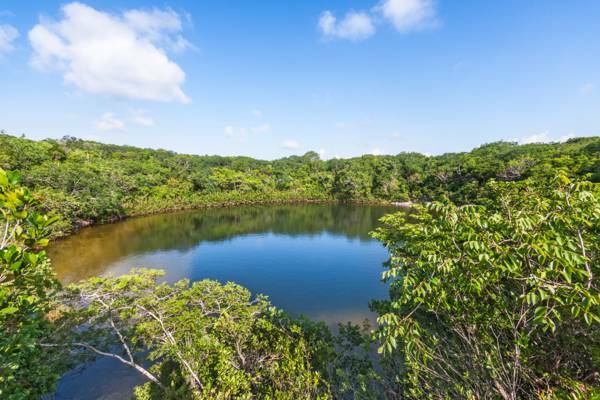 Found close off of Sandy Point Road in North Caicos, Cottage Pond is a 150 foot (45m) diameter and 250 foot (76m) deep naturally-formed submerged sinkhole. The feature is technically referred to as a blue hole, and the geological action that created it is called the Karst process. Sea level greatly effects blue hole formation, which is probably why the Middle Caicos Ocean Hole (likely the widest blue hole in the world), found 19 miles (31km) away has a similar depth. Cottage Pond is tidal and distantly connected to the ocean, likely through a series of tiny fissures and tunnels. The surface of this pond offers about 20 feet (6m) of relatively fresh water, which is largely a reflection of the fresh water lens at that region of the island. Under this lens is a halocline mixing layer, and below that, water similar in salinity to the ocean. For most visitors, Cottage Pond really doesn’t offer much other than the sights of a small scenic pond. However, the site is the perfect opportunity to see a tropical blue hole. It offers quite a few interesting features for nature enthusiasts and birdwatchers, and is definitely warrants at least quick stop. Cottage Pond is a great spot for bird watching on North Caicos as it’s easily accessible. 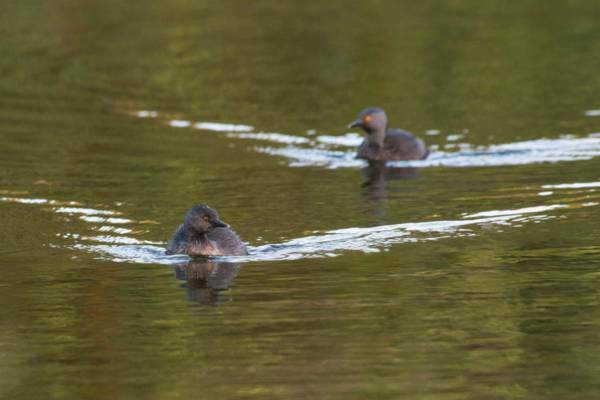 It’s common to see ducks, warblers, gnatcatchers, and as shown here, Least Grebes. In the past, the depth and structure of Cottage Pond was a mystery, however in 2001, the bottom of Cottage Pond was reached by the Caicos Cave Project cave diving team. Due to the depth of the feature, it was necessary to use complex diving technique and gas mixtures in order to reach the bottom. During these explorations, it was found that past 140 feet (43m), Cottage Pond opens into a much larger cave. A unique specie of marine remipede, christened Kaloketos pilosus, was also discovered during subsequent dives. Cottage Pond is located on Sandy Point Road, which is the main paved road which leads for about three miles from the Sandy Point Marina ferry dock. The entrance for Cottage Pond is located on the eastern end of the road, about three quarters of a mile (1.2km) from the T-junction (near the small gas station) of Sandy Point Road and Kew Highway. It’s very easy to miss the entrance to Cottage Pond when travelling southeast from Sandy Point due to the direction the road sign faces. Cottage Pond does not have any safety handrails or paths. Be aware when visiting with children.